But LinkedIn seems to mystify indie authors. What good is it to have a presence there? What can it do for your writing career? I put up a poll next to the dart board in the deathstar’s tactical operations center to see if any of the minions had cracked the code. Respondents were allowed to pick more than one answer. If I’m reading around the pinholes correctly (some people can’t aim a dart to save their lives), it appears none of us has figured it out. 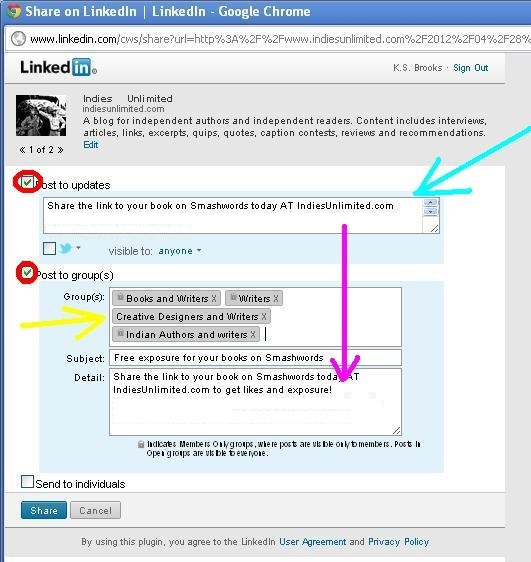 Ten admitted going to LinkedIn only to accept offers to connect; four of us share blog posts there – including from IU – in LinkedIn groups; two post items to their timelines; two comment in forums; two endorse other people; and two admitted they can’t suss out what it’s for. One person said she goes there only to clean the spam out of her inbox (I admit nothing!). One said she had closed her account because she hadn’t found a use for it. And four of us said we’d have a bigger presence there if it got us readers. As we discussed the poll results around the gruel cauldron, we decided that the problem is that LinkedIn is aimed at a specific sort of networking: business connections. It’s useful for perusing the want ads. And it’s great for people who want to establish themselves as experts – so it could work as a platform for someone who has written a how-to book. Some folks have seen results by posting items to their LinkedIn timelines. It’s pretty easy to do, and you can post to a group (or several!) at the same time, as you can see in the graphic below. If you tick more than one box (see the ones circled in red), you get options for posting in multiple places at once. If you’re looking for service providers, LinkedIn is a place to start. One author in a Facebook group said she got an invitation to a radio interview via LinkedIn, and another said she has found guests for her podcasts that way. Some authors have a problem with conflicts of interest. My list of connections on LinkedIn is fairly schizophrenic: I’m connected with lawyers (from my current day job), media types (from my former career in broadcasting), and a whole lot of indie authors and service providers. I used to have my blog feed directly to LinkedIn, until I realized all of my connections could see my posts, and some of them might not convey the professional image I was trying to foster at the day job. For novelists, LinkedIn’s utility appears to be limited. You’re not going to find many readers there. And the writers’ groups seem to be chock-full of newbies asking the same questions over and over – and in many cases, getting bad advice. You’re better off coming to IU for the real scoop on those kinds of things (she said modestly). But hey, maybe we’ve missed something. Have you found a terrific use for LinkedIn that we haven’t thought of? Please share it below. Lynn I enjoyed this post very much! And I am in agreement with much of what you say…particularly that this forum at IU provides way more help for any writer…newbie or not…than most of the writer forums (at least the ones I belong to) on LinkedIn. But I wanted to tell you about my success with LinkedIn as a writer/author. I post a weekly blog that is aimed at engaging the reader with my voice, rather than my book specifically. The idea, of course, is if they like my blog they might be inclined to buy my book. I do have a theme that is related to what I write about…which is largely, though broadly, injustice. I joined Bloggers helping Bloggers where there is a thread every week to post your blog. It’s a reciprocal thing…you comment on their blog and/or subscribe and they return the favor. It took a little while, but I have new subscribers and have sold about 12 books. Okay…it’s not a lot of books… Laugh! But the hope is that they might share with their peeps. So with LinkedIn, I think it’s really a matter of engagement. Because the book IS the business and I think if used properly LinkedIn can be another tool. I think that’s true of any of the social media sites. If all you’re doing is pitching your stuff, it will fall on deaf ears. My issue with LinkedIn is that I haven’t really figured out how to engage effectively yet. I take little runs at figuring it out, though, so I’m sure I’ll get there eventually. Of course! And I agree…it is harder on LI because you have to filter though so much! Congrats on your success there, Jacqueline! 🙂 As Shawn says, it sounds like the key is making connections, just as on any other social media platform. I find it often gives me a few sales if I announce a new title, but I think it’s only because old friends and colleagues see it. And obviously that doesn’t happen very often because I don’t announce something like that very often. Once in a while if I offer good advice in a group it might get me an indirect sale, but I just don’t dive in very often. I do think it establishes a certain degree of credibility to be on it if you have good number of connections and recommendations. I luck out a bit with that since I used to work in publishing and advertising. I also wish it would stop asking me to link up with people I (sadly) know to be deceased. Apparently our digital lives are eternal. I have been very happy to connect with other authors in writer’s groups on LinkedIn! When Linkedin first started, I made four very good friends, from all over the World, that I still keep in touch with, today. However, with today’s Linkedin, I hardly look at it. Same here, Jacob. I met a few authors there that I’ve since run into elsewhere on teh intarwebz. But I find I don’t bother with groups there any more. Yeah, that’s my experience as well. I met lots of great people there, but it seems we’ve graduated from that platform. I think LinkedIn is meant more for the professional work connection market. 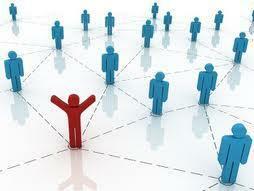 That is to say, people in business looking to network with others in their related fields. Writing is more about promoting your work, from a social media perspective at least, and LinkedIn tend to attract people who are looking to network with others for business goals or projects, rather than looking to find products to buy. I’ve personally been recruited to jobs through LinkedIn so I can vouch for its efficacy in that department, but I’ve noticed that if I want to just interface with other writers, I’m better off here at IU or on the /r/writing subreddits over at Reddit.com or on any of the other thousands of writing sites. Some social media just isn’t designed for promotion and authors should be aware of what will be the most efficient social media for their target audiences. I agree with everything you’ve said. LinkedIn is better for business-to-business connections, and less so for finding readers. In my experience, at least. I would agree with this, Linkedin is in my mind the online equivalent of some sort of Chamber of Commerce, mainly good for business-to-business services and the sort of networking that doesn’t work for people who have a product to sell to the general public. I have picked up some website writing connections (and I have a profile there for that purpose) but I don’t think it helps to sell books to strangers at all. I enjoy staying connected with old work associates via LinkedIn and also had engaging discussions and sharing with various other groups. Anyone who wants to stay current with business practices, marketing and other interests you may have, can find great information and discussions in the right groups. Don’t limit yourself to pushing your book – talk about art, history, business news, and yes publishing. Like any medium, you get what you put into it. Lynne, lately I’ve been more diligent about posting great IU articles on the various writers’ groups I’m in, and I’ve noticed some good discussions going on. I’m hoping more will gravitate toward IU and get the real lowdown, since there is a lot of mediocre info on LinkedIn at times. Thank you for posting my question, and thanks everyone for your answers. I do have a Linked In account, at first because I was helping my niece with a school project, and then I felt guilty for not updating it. Even as I gather connections there, however, the question “to what purpose” has occurred to me more than once. If I’m interpreting the many answers correctly, the primary purpose would be to build an online presence. The second piece of advice is to be very focused in your creation of that presence. I get what you’re saying about crossing over professions, Lynne. Do I want my teaching presence to be associated with my writing persona? And vice versa. Food for thought. Like Jacob, I met some wonderful people there. For that I will always be thankful. I get connection requests from a lot of people I have never heard of. I can only suppose that they’re brand-new authors, looking through the lists of other people’s connections and sending requests to connect to all and sundry. You make an interesting point about newbies asking the same old questions and this just demonstrates that LinkedIn does have a value as an entry point for those new to the field. At the same time it offers the opportunities to pen discussions on topics that reach a wider audience than just writers and those interested in writing. I think my list of connections covers people in over 40 different professions and trades. They’re connected to me because they (mostly) are interested in similar things and often share some common experience. I read many different discussions, although as I’ve learned and gained more experience I contribute to fewer, preferring instead to come over to IU where the interest link is stronger and the level of specific experience that is accessible if much greater and more directly relevant. But LinkedIn does have its uses and its value: I found my publisher as a result of a comment posted in a LinkedIn discussion five years ago. He has so far published six books of mine, with at least another one due out this year. I had been ten years in the wilderness before that. I’ve also established contact with a number of authors to whom I’ve been able to give some help and have met and made friends with others. That has opened up a different aspect of networking as we now meet at events many of us might never have heard of, and the word of mouth circuit is alive and prospering at a local (within 300 miles) radius. Yes, it has it’s place, but it’s not the be-all and end-all. My question is what the hell does “IU” stand for or mean? Thannks for your response. Damn, my brain hasatrophied, IU , Indies Unlimited, of course! If you look on the Death Star website thingy you’ll find IU also stands for Information Unlimited about writing topics, Inspiration Uploader for problem solving, and I Use it, for all sorts of other useful and informative and entertaining thing. Its almost a complete universe, so IU also stands for Incipient Universe. That lot should make the Evil Mastermind hiccup in his coffee! He’s an alright geezer actually, but don’t let on I told you so. Thank you for your response, yes, I’ll certainly check out Death Star’s Information Unlimited. Thank you too Yvonne for your reinforcing Ian’s message. I began my foray into social media at LinkedIn, and I’ll be grateful to the platform for two things – allowing me to connect with a couple of Indie writers who are still friends today, three years on, AND for leading me to IU by the back streets. Hold on A.C. ! IU is not just for novelists. I’m principally a non-fiction writer and find IU is a most valuable, informative and useful forum. True, I have just recently branched out and released a novel, but that’s a new venture. Please don’t write off the rest of our work!